Your kid may get mistaken for a museum exhibit! Every kid has a favorite dinosaur. Some kids love the T-Rex, since it has big, sharp teeth! Other kids like the Triceratops because it has three big old horns on its head. Some kids think that the Stegosaurus is pretty awesome since it has a big, spiky tail! And some kinds like the Concavenator, because, well, it has a weird name and it's a weird-looking dinosaur. Us? We might not be kids, but we have a favorite dinosaur too! It's the Pterodactyl. Why? Because it has wings, of course! With those kind of wings, it could fly around the prehistoric land, scoping out the scene. That's also why we think that the coolest fossils are those of Pterodactyls and being the costume experts that we are, we sought out a cool fossilized version of our favorite dino! This child Pterodactyl Fossil costume turns any kid into a skeletal version of the dinosaur known for cruising the skies! 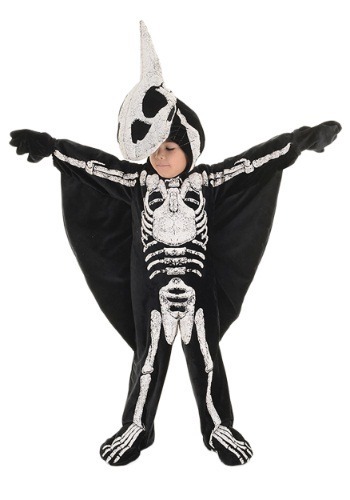 The skeletal outfit comes with a jumpsuit that fits with velcro in the back, along with a matching hood that will have him feeling like he just came from a museum exhibit. Actually, we recommend not taking him to the museum while he's wearing this costume, since they might try to put him on display with the rest of the dinosaurs living there! My grandson wanted to be a dinosaur and picked out this costume. I used the measure info provided and got the right size. Fits great. He loves it, good material, and easy on and off. Pinned on the hand covers so they don't get lost. A happy kid ready for Halloween!